Chicago's mayoral candidates have already sparred on their different opinions regarding education and public safety, but a new issue popped into the campaign conversation when Cook County Commissioner Jesus "Chuy" Garcia expressed his opposition to having President Barack Obama's presidential library placed on park land. 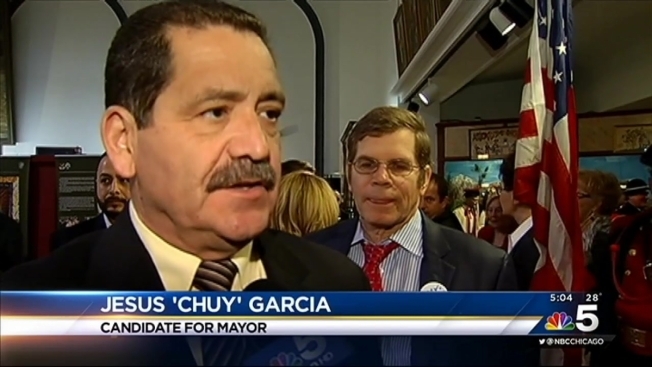 Garcia reportedly made his comments on Thursday to the Chicago Sun-Times, placing another wedge between him and incumbent Mayor Rahm Emanuel, who supports having the library, museum and academic center placed in either Washington or Jackson parks if the University of Chicago wins the bidding process. "We have to protect park land. It’s not like there’s no other place to do it. Just because some interests with important connections want it there doesn’t mean it has to go there. I’m a parks guy. I feel that parks are sacred," Garcia was quoted by the Sun-Times as saying. In late December, the Obama foundation let it be known publicly that it had serious concerns about the University of Chicago's bid — in particular, the school's failure to prove it could secure the Chicago Park District land on which it was proposing to build. That set off a scramble by university officials and Emanuel, and earlier this month, the park district's board voted unanimously to transfer 20 acres to the city, to be leased to the foundation if the University of Chicago gets the library. Obama's foundation said the move had improved Chicago's bid, in yet another indication that the University of Chicago was on track to win the library. Yet a small but outspoken group of opponents, led by the nonprofit Friends of the Parks, has continued to argue that officials have yet to prove the Obama legacy project is worth the land-grab from city park-goers. The University of Chicago bid is in competition with one from the University of Illinois at Chicago, as well as bids from Columbia University in New York and the University of Hawaii in Honolulu. Obama is expected to select a winner within weeks. On Thursday, the Associated Press and the Sun-Times, both citing sources, reported that South Side residents were recently polled to gauge support for the project on public land. The Sun-Times report indicated that just 24 percent of those polled opposed using Washington and Jackson park land if one of those sites is chosen. While in town last week, Obama stopped by his family home near the University of Chicago's campus for an update on the selection process by the foundation's chairman, but the White House said no decision was made at that time. Emanuel on Tuesday failed to garner enough votes to win the mayoral election outright, extending his campaign against Garcia, his closest challenger, another six weeks. The election is April 7.